You know that what my family and I do best is eat. And eat we did. After looking at that really old stuff, we eventually got hungry again. 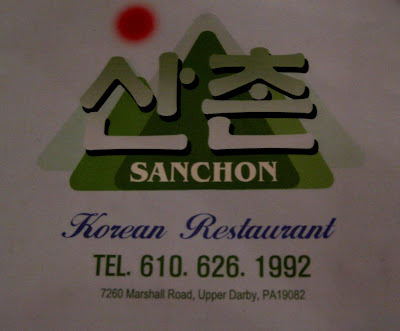 A new Korean restaurant opened up in Upper Darby, so we decided to check it out. It’s called Sanchon. It’s in a horrible building that looks like a diner and used to be a weird buffet place. After we ordered (what ended up being way too much food), they gave us some complimentary appetizers. 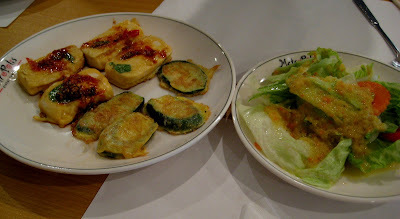 Some fried tofu and zucchini and a simple salad with ginger dressing. Word, this dressing, like the kind you get at japanese places, was so damn good. I could have just eaten a big vat of this stuff. 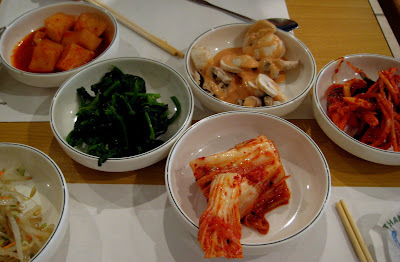 Then the banchan came out, and even more complimentary food came out! Some salted and grilled mackeral. I love fish like this. It’s so simple yet so good. 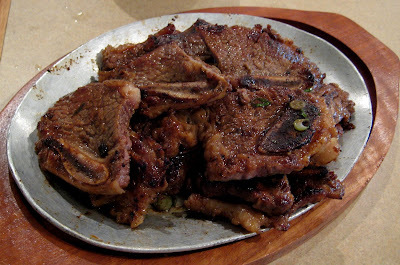 We had to try the kalbi, so we got one order. It was only supposed to be for one person, but man, this was enough to eat for 3-4 people. Whoa. It was pretty good too. Sis-in-law wanted some korean fried chicken. 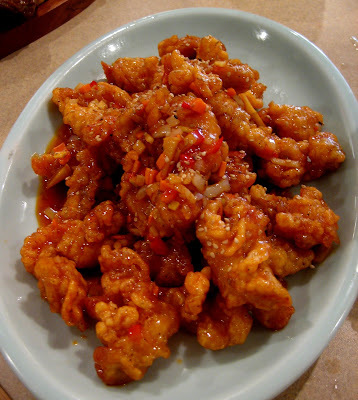 They did not have that on the menu, so she got the ganpungki, which is a deep fried and then stir fried sweet and spicy chicken dish. Pretty good. 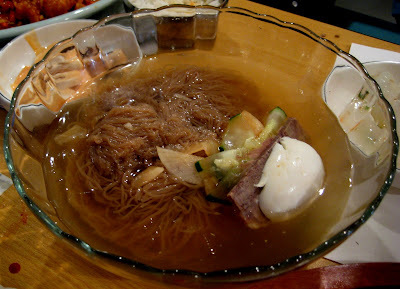 My bro wanted the mul naengmyun. Happy to say that this was also pretty good. Sometimes, you want a cold noodle soup. Or at least I do. 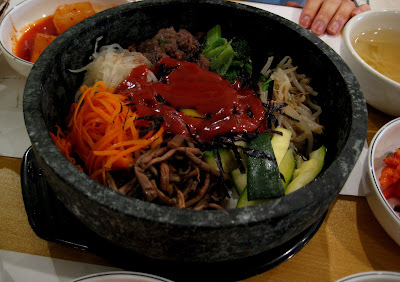 Mom got the dolsot bibimbap. Good as well. Me, I got the yukkaejang. It was also pretty good, not as spicy as I would have suspected it would be. It was also not temperature hot as I thought it should be. All in all, the food was good. There was nothing great about any of it, but it was all good. 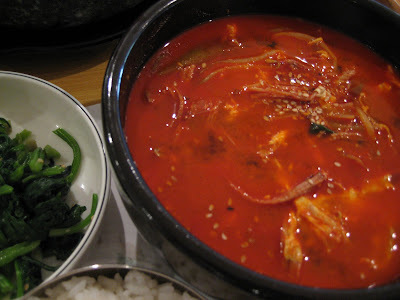 And for korean food, it was quite inexpensive. And man, was there lots of food. We had tons of leftovers!